The front entrance to the St. Kitts Eco-Park, known as the Agro-Tourist Demonstration Farm Co-Op. 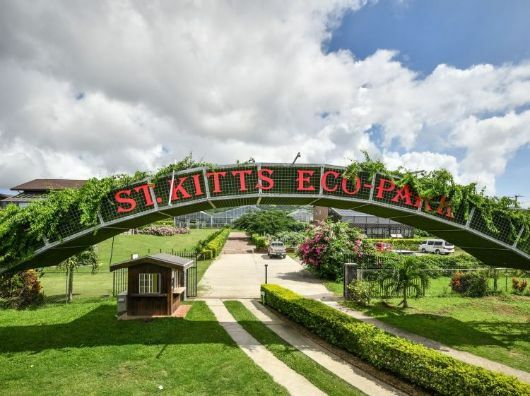 BASSETERRE, St. Kitts — Residents living in areas surrounding the St. Kitts Eco-Park, known as the Agro-Tourist Demonstration Farm Co-Op were encouraged to think outside the box to capitalize on the high traffic at the site, which is located in Sandy Point. “Experience has shown that when properly managed, initiatives such as the Eco-park spur private sector innovation,” said St. Kitts and Nevis, Minister of Tourism, the Honourable Lindsay Grant during the ceremony to mark the official handing over of the Eco-Park from the Republic of China (Taiwan). “Infrastructural development and employment opportunities increase as ancillary services such as restaurants, car rentals, tour companies and a myriad of other businesses spring up in the nearby communities to cater to its demands,” said Grant. The minister pointed out that with the local tourism landscape expanding to more rural communities, a community-based division in the Ministry of Tourism has to be set up to ensure that the tourism dollars are not only spent in Basseterre, but in areas like Old Road, Sandy Point, St. Paul’s, and Cayon. Minister Grant said the new construction sites appeal to the upscale visitors who are looking for an off the beaten track vacation and hideaway. As examples, he pointed to the St. Kitts Ramada Hotel, just outside Newton Ground, which is set to open its doors in September and the Kittitian Hill Development located in the hills of St. Paul’s. Grant said the Eco-Park, intends to capitalise on the close proximity of these properties to network and forge mutually sustainable business relationships. Grant appealed to taxi and our tour operators, companies, and to the established sites and attractions such as the Scenic Railway, the Brimstone Hill National Park, Caribelle Batik/ Romney Manor and the Amazing Grace Center to collaborate with the Eco-park.